While the head Mouse is in England, I am tackling another painting job. So far so good. The room should be ready for Susan to hang the multitude of mirrors that I took off the walls. In the meantime, all framed mirrors and artwork are 15% off this week. I will be posting my recent adventures in DC and my visit to the Dixie Motel in Emporia this weekend with some interesting (I hope - I have not look at them yet) pictures. Take care. On Thursday the 3RD I drove the moped to Palmetto Power Sports on St. Andrews Road for its 500 mile tune-up. The temperature was 36 degrees F. and windy. The drive was 5 miles (one way). Needless to say it was cold!! I retrieved it later that day and drove it home (with more layers of clothes than before). I turned 54 on Friday the 6TH without much fanfare (thank god! ), and the air temperature was beginning to moderate. I decided to be a little adventurous on Sunday and took the moped out for a little spin to Lake Murray and back (approximately 30 miles round-trip from The Mouse House). If anyone would have told me a year ago that I would be riding a moped at 50 MPH and cruising with the Harley guys and gals over Lake Murray, I would have checked their temperature! But that is what I did, and I had a blast!! I only got passed once and that was on the right by a Harley who wanted to prove he was more of a man than me! I took some pictures to prove that I actually did this. 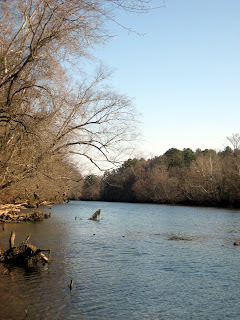 The first picture is the Saluda River looking downstream at Gardendale. This is a take-out spot for canoes and kayaks coming upstream from Saluda Shoals and the Lake Murray Dam. We've used it many times in the past. Its location is off Gardendale road which intersects Bush River Road. To reach the river access you must pass Gardendale Swim club. This is where Mathias and Alex learned to swim many years ago. They have spiced the place up a little bit and it brought back some nice memories. My adventure continued up Bush River Road to St. Andrews Road to Bush River Road and toward Saluda Shoals and Lake Murray. Bush River Road is two lanes and has posted speed limits of 45 mph which no one obeys!! (including me at times). 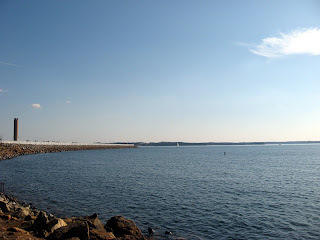 Bush River Road runs into Route 6 where there is a large parking lot and boat launch. I have to admit that I've not ventured out to the Lake Murray dam since 2001, and boy has it changed!! The place is wonderful, filled with boaters, fisherpersons, picnickers and bikers. 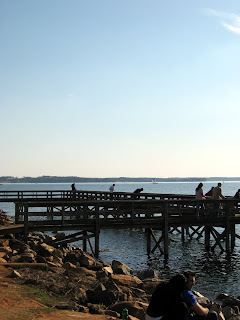 The road across Lake Murray is a 4 lane highway that sits atop the dam. There is a bike lane and a separate, safe pedestrian lane (toward Lexington) where one can walk across the dam. The road toward Irmo sits between the original dam wall and the newer wall built several years ago. 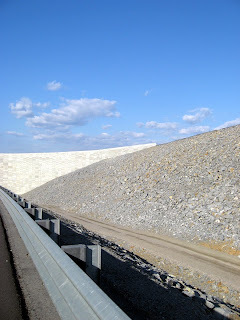 I've included a picture taken from the moped that shows the dam walls. I've already told Susan that we must return and walk across Lake Murray. I'll suggest that she rides out to the dam and become a "motorcycle mama" like her old man! I'll meet her in the Scion. I'm not quite ready to ride double!